The Executor is Darth Vader's flagship seen in The Empire Strikes Back and Return of the Jedi, where it is taken down by a single A-wing fighter which crashes into the bridge. The Executor loses control and collides with the Death Star. Learn everything about it at TheForce.net, from where I have found the best pictures of the original model and the length of the 'real' ship. The real ship is 17600 meters long, and since this model spans 157cm, it is in scale 1 to 11205, so details like turbo lasers can't be seen on this model. Is the link to the instructions broken? Great model. Your version is simple and elegant. Well done! Magnificent, isn't she. Perhaps the most viewed moc on this site, and for good reason. I love your creation and I don't no any better model of this ship. Thank you for the building instructions, too. 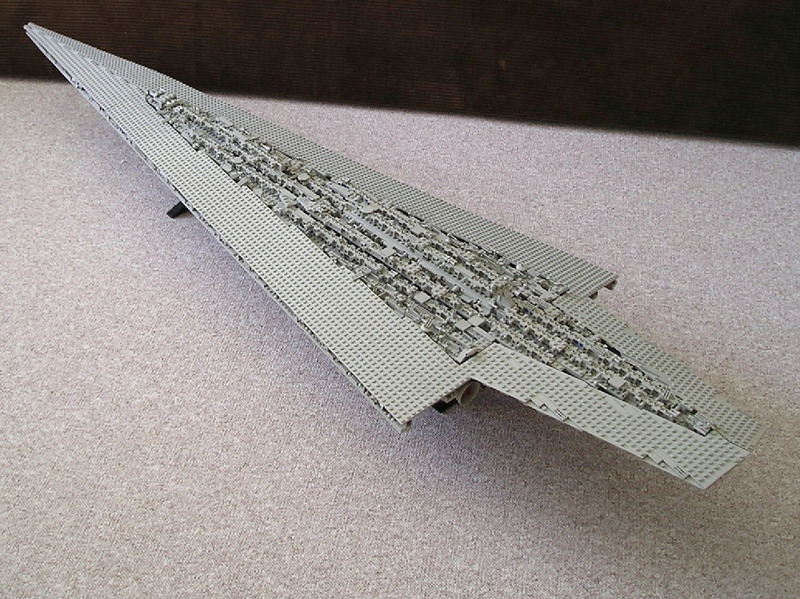 So I could also build this phenomenal stardestroyer. 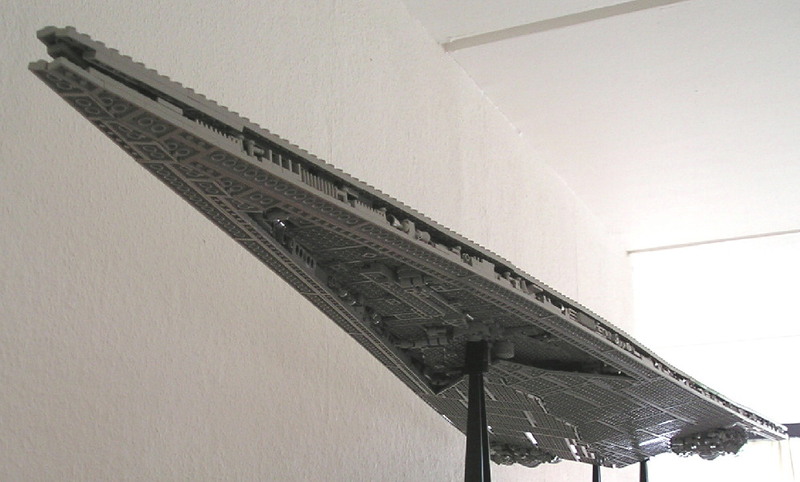 Maybe Lego should've contacted you for their Super Star Destroyer. Because this looks so much better! The technique you used for the "wings" is awesome! THUD! (Jaw dropping to floor) Oh my goodness this is just as cool as the 8ft long rebel ship! It's great that you made instructions. BTW who/ what made those instructions? Thanks. INCREDIBLE! VERY BEAUTIFUL! Thankyou for the Building Istruction. I have the Sets 10030 and 10179; next time I'll build your fantastic Executor! This was my favorite ship of all time in the Saga, and it does absolute jack! Respect! The creation is cool!! Please, check out my creations!!! That's terrible. Others have had similar complaints when building it, but they somehow managed to get it done (at least those I know of). I know from my own experience of building it several times that the final assembly is simply too difficult. I would like to revise the model at some point because of this. The Grand Emperor Of The Galctian Empire . It is a master piece. You inspire me to make a super star destroyer. I will use your building instructions and i will edit it myself. Would take a long while to finish because of school. But im doing it!! Absolutely fantastic!!! I�m a StarWars Fan...it great to see this great starship!!! Thanks. Very good work!!! That Executor is very good! 100000/5! WTH! OMG! How did U make that? Can you please send me the instructions! Thanks! I have to build it. I have never seen an executor done this well! It truly is amazing and incredible. I don't even think a 5/5 gets it! tis is worth 100000/5! that has gotta B the best thing I've ever seen.Words don't even put justice to the pure quientesence that this is!!! !One question, How the heck did you get that thing from where you made it to infront of your couch?! This is the Executor-Class Star Dreadnought. It is the largest ship in the Imperial Navy, second only to the Eclipse-Class. It appeared in Star Wars Episodes V and VI. In the starWars universe, it is 19 kilometers long, and carries 144 TIE/in fighters (fully loaded, they number in their thousands). This is a very good MOC. I love your attention to detail, even in the superstructure! What is it? I think it stinks if i know what it is I might like it. i hate it right now!it looks cool thow I don't want to be mean. We wantss it! We wantss it, my Preciouss! One of the best all-time Lego creations and one of the inspirations for my "Home One" Mon Calamari Cruiser. I hope one day you attempt another project of this calibre. Dude, i am speechless. That is the most.....AMAZING THING I'VE EVER SEEN!!! The Executor was and still is my absolute FAVORITE Star Destroyer. A job well done. THIS IS AWESOME!!! YOU ARE THE BEST!!! ................................................ YOU MUST OF HAD ALOT OF TIME ON YOU!!!!!!!!!!!!!!!! HOW LONG DID IT TAKE? man thats awsome!!!!!!!!!!! I don't now wat I most say..... it's.....it's FACKING BEAUTIFUL!!!!!!!!!!!! This is so freakingly BIG!!!!! awsome! you should upscale it though! Hmm, very impressive model. Seems to have perfect and accurate shape and proportion. I especially like the engines. However, I don't understand why anyone could rate this less than 5 stars! It may not be the best creation on mocpages, because more and more are always rolling in, but it certainly can be a favorite. I personally believe that the best starwars moc is yet to come, maybe in years. 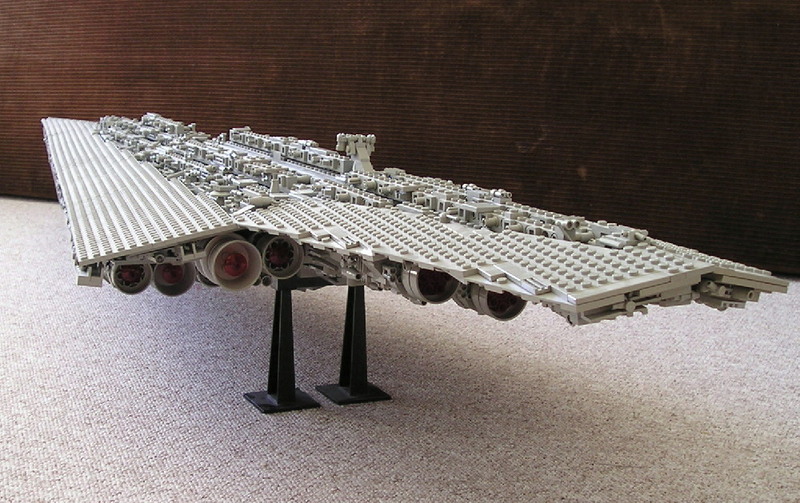 (BTW, the 8 ft. long Venator built by that official Lego company masterbuilder doesn't count!) I will be uploading what is to become the very first mini-fig adapted UCS ISD (With hardly any modifications to the exterior!) to date within the next month hopefully, so please stop by. Only one title is fitting for this: 'The Best Creation on Mocpages'!!!!!!!!!!!!!!!!!!!!!!! Really nice! Just an idea: remove ALL the greebing, cover it up, slim the rear and bamn instant sword thing. wow, incredible! and even more incredible that you made instructions!?! nice, bro. I luv the thinness, reminds me of the Razr. If that can never be a Lego set, Lego needs to change their rules! I made a mini one of it but it pales in comparison to your ultimate beastly Star Destroyer!!!! a stunning creation - thank you for sharing the instructions. Lee. You, my friend, have A LOT of time on your hands. That thing is awesome. that thing is SICK!! you have some mad talent and a lot of time. but man it was worth it. The Essence of Krispy Kreme! F. Y. I., the A-Wing pilot was Arvel Crynyd; sometime later (Yuuzhan Vong War maybe?) the New Republic named a Star Destroyer Crynyd after him. B. T. W. (I like acronyms), another Super Star Destroyer was Isanne Isard's prison ship Lusankya, it was captured by the New Republic and was sacrificed to destroy a Yuuzhan Vong World-Ship of which I forgot the name. well,im a huge and important star wars critic.my reviews are finall.the eclipse is longer than any other ssd ever made. Impressive - MOST impressive!! And instructions as well! I think I might attempt to build this one myself. Thank you very much! This is one of the best LEGO creations I have ever seen in my life. When 10030 came out, I was completely stunned, but this................... THIS PWNS!!! to heck with that miguel guy,wats his deal?hes weird.this is great!beats the one at lego by a longshot! :P i love it! that the model is fantastic and can you plz send me the instructions for this thx. Sweet COw of Moscow! This is huge!! !Now that is impressive work! very nice to show us the details and progress of the build! bravo! DAAAAAAAAAAAAAAAAAAAAAAAAAANG!!!!!!!!!!!!!!!!!! I used to consider myself a lego inventor, with my invention of a bunker thing(not the ep. 6 shield bunker). But this is like, inspiring! I really have to push myself to do better, but I don't think that I even have that many legos! I have to tell my friend about this. His room is completely packed with legos. You can't see much of the floor. He might be able to make one. i just had to make another reivew! that kind of looks like the super star destroyer. but sooooooooo cool!! 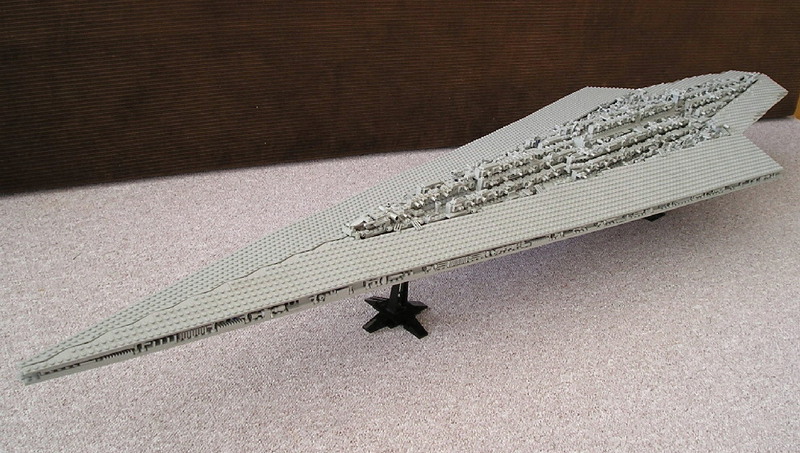 Absolutly beautiful...Lego should give your Star Destroyer a full page in the Mag. Do u mind if I copy the zig-zag idea? WOW!Wonderful cruiser!I would like to know if you are willing to sell this model. I would give you up to 300 dollars US for it! OMG YOU CAN'T MEAN YOU CREATED THIS!!! now i'm going out of my room crying. that is too cool. godt v�rk. I Really don't have words to describe how GOOD IT IS! I...I....I'M SPEECHLESS!!!!!!!!!!!!!!!! This is the best Lego I have ever seen in my life!!!! If it was possible I would have given you 100 smilies!!! It's huge!!! At this rate you could make a lot of money joining Lego and making designs for them!!! Also the person who gave you a 1 out of 5 rating and called your ship stupid must know nothing about how good this is. Ignore him! If I didn't have such good eyesight I might have thought this was the model they used in the movie!! Awesome job Lasse!!!!!!!!!!!!! WOW!!! Words cannot describe the beauty of this ship. I has got to be one of the best Star Wars creations I have ever seen. The attention to scale is astonishing. I don't know anyone who could give this less than a five. I'm at a lack of words. This SSD stuns me. EXCELLENT WORK!!!!!!!!!!!!!!!!!!!!!!! My jaw dropped when I saw this. It has to be one of the most incredible ships I've ever seen.I don't see how anyone could give you less than 5 smileys, except out of jealosy. You gave incredible attention to detail.